It's that time of the month again... No, not that one!!! It's time for There She Goes release!!! One of my fave times of the month. It’s no secret, we are DEFINITELY in love with everything Torico does here are There She Goes, and we know you are, too. This month she has honored us by creating a set that we have been begging for…meet The Doxie with Moxie!! SUPER cute dachshunds, along with several sentiments, outfits, and even a city scene for our more “elegant” pups, this set is just TOO much fun. Isn't he handsome? This wiener is already for a night out!! LOL!. I had so much fun making this card using the current Deconstructed Sketch. For my card, I decided to pull out my totally neglected Prismacolor Pencils and my Gamsol and went to work. I love the way Prismas look on Kraft. Hope you like it!! The Doxie with Moxie is a 4x8 set that includes a total of 32 stamps and will sell for $18.00. When brainstorming The Doxie with Moxie set, there was a lot of chatter about sentiments…and some of them took a turn for the funny, but…risqué, lol! We couldn’t live without them, so we decided to create the Size Matters set. It’s not for everyone, but it’s definitely funny!! Size Matters is a 3x4 set that includes 7 stamps for $9.00. 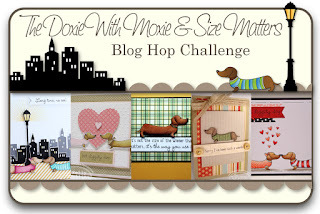 Would you like to win the new The Doxie with Moxie and Size Matters stamp sets? Here is what you need to do-visit the Trendsetter’s blogs that are participating in each of the blog hop challenges below and comment on their creations as you go. One of the Trendsetter’s blogs (from each hop day) will be randomly chosen as the ‘it’ blog and a winner will be picked using a random number generator from the comments left on that Trendsetter’s Blog Hop Challenge post. Pretty card, the doggie is cute and the papers are nice! You superstar you!! I've been thinking about watercoloring on kraft cardstock, but I think I might get it too wet. This is awesome Angela! Great job! Gorgeous, love that you have coloured on Kraft, i must try that! Wow what a cute set!!! your card is Fantastic!! Love this little dog! Thanks for sharing! Wonderful masculine card - love this pup! Beautiful card! Love how your wiener dog looks like a painting! so freaking cute I have to have it! Loving these little dogs - great design, love the twine! Saw this on Pinterest and HAD to check it out!! Adorable card. I love my doxie and so this is a must-have set for me!! This is going to be such an awesome set to play with! Love the layout and the different textures on this card. Beautiful! Totally adorable and beautiful. This is the cutest set ever. Such a cute card. I love all of the doxies! cute card! Great stamp set! Great card and I am LOVING this stamp set! Great card! I love the colors and papers. You are rocking the coloring on kraft! Great card!! Your papers look great with your little guy. Nice. I just have t laugh, when I read those sentiments! Great card! I like your mixture of papers. They are different and nice. Good job. 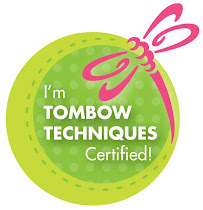 Fabulous, great papers and like that you stamped the image on coloured cardstock! Great papers and I like the coloring on kraft. Love your mix of papers--great colors! As for the sentiments...too funny! I really like the colors you used and I like how you stamped on Kraft paper, really like the look. You have a very cute wiener...card! :) LOL Thanks for the chance to win! I always admire your choice of PPs. This is such a cute card. Thanks for sharing! Heehee!! That is tooo funny!! Adorable card! such great papers and love the colouring on kraft. Fabulous card! Love the color combo - great for masculine cards! I've never tried using the prisma on kraft paper but I'm certainly inspired to try now! No he isn't handsome he is A D O R A B L E !!!!!!!!!!! I love what you did with the Doxie...I can not WAIT for this stampset!!!!!!!!!!! (giggle) Super cute Angela! Lovin' the polka dots! Very ,very cute! love the look you got with the prismacolor pencils and gamsol! I love the papers you've chosen! CUTE little doxie and super FUN patterned papers!!!! Cute card! Love they layout and colors! Wonderful coloring on the wiener dog! Prismas on kraft makes me want to play! lol these sentiments are a scream!